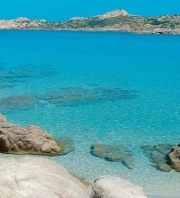 The Ideal Apartments are located in Isola Rossa, a town on the north coast of Sardinia situated halfway between Porto Torres and Santa Teresa di Gallura. Besides the beautiful beaches of fine sand, the resort has a modern marina with all services for recreation and red cliffs which is rich of small coves. The Ideal apartments consist of recently built residential units with good quality furnishings. They are located on the ground floor with garden or on the first floor with terrace or veranda. Distance from the sea from 40 to 250 meters. 2-room-apartment with 2 beds: Room, living room/kitchen corner and bathroom. 2-room-apartment with 4 beds: Double bedroom, living/kitchen corner with sofa bed and bathroom. 3-room apartments with 4 beds: 1 bedroom, 1 room with two single beds (or bunk bed) living room with kitchenette and bathroom. 3-room apartments with 6 beds: 1 bedroom, 1 room with two single beds (or bunk bed) living room/kitchen corner with sofa bed and bathroom. 4-room apartments with 8 beds: 2 double bedrooms, 1 room with two single beds (or bunk bed) living room/kitchen corner with sofa bed and bathroom. Restaurants, pizzerias, bars, disco bar with live music, market, crafts, sports centre with tennis courts, bowling and soccer, sport fishing, cash, medical, church with Mass on Saturday afternoon. A small part of the beach of Isola Rossa is equipped for the hire of deckchairs, umbrellas and boats of every type (pedal boats, canoes, surf). Here you can take diving courses with PADI patents at all levels.